It was a weekend of fun. It was a weekend of laughter. It was a weekend of "I'll never forget's." Sister and new brother... I love you both! and for playing "A Whole New World" at your wedding. I will never think of Aladdin the same again. Gorgeous bridesmaids dresses! Love the scarves. Congrats to your sister! :) How exciting. You guys look so much alike. YOU LOOK STUNNING. All over! WOW - I am in LOVE with that second photo of you. That pop of color compliments your features perfectly! And I love the delicate scarves. Congrats to your sis and brother in law! Aladdin is my most favorite Disney movie EVER :) Glad you had such a great weekend!! Y'all look amazing! I'm glad you had such a great time! You are all so gorgeous!! I love your sister's dress!! 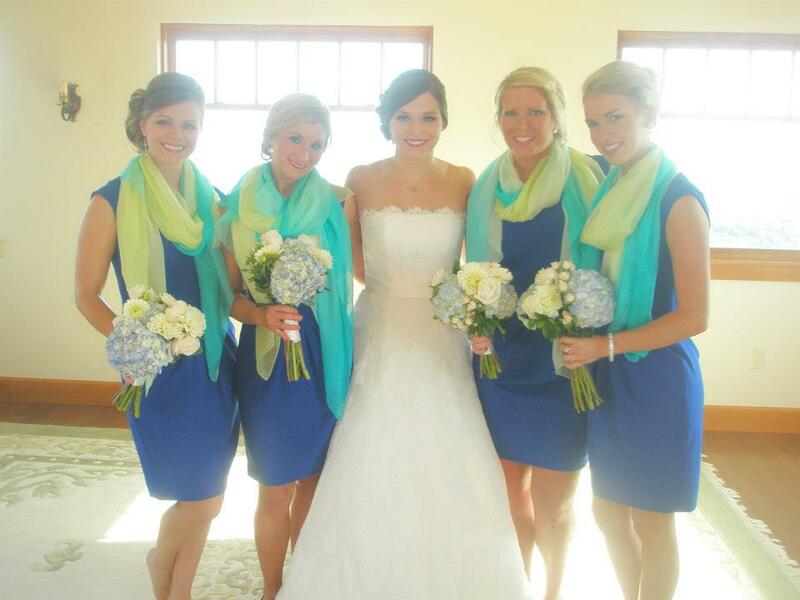 I love the scarves with the bridesmaids dresses! So beautiful, I absolutely love those colors. The scarves were a great idea. And congrats to them! Scarves?! How cool. You are a gorgeous family! You and your sister are both so uniquely pretty! You don't look too alike, but you are both gorgeous girls. I really like the scarves... I've never seen that before. My first thought was maybe it was a culture thing? Is that naive? lol Did your sister marry someone from a different culture? Ignore this question if not. Lol. Love those scarves, what a cute idea! Those scarves are definitely the best bridesmaid accessory I have ever seen. I am totally stealing that idea for my wedding, I wear a scarf every day of the year ap it should definitely be on our big day!! Seriously, well done to your sister for that beautiful idea! And her dress!! My goodness!! So gorgeous!! You're kidding, they did NOT play Aladdin at their wedding! Oh man, my kinda wedding! Love those scarves too, that is so unique! What a gorgeous pair of sisters! Congratulations to her!! You all look so lovely. I love the colours of the bridesmaids dresses! Oh gorgeous! I <3 the light flowy scarves. Fabulous idea! All of you look amazing! And I love the scarves with the dresses :) Absolutely stunning! Ah so lovely! funny thing.... I had a dream with you and Daniel last night:P hahaha it was pretty awesome. Anyways you all look beautiful. Did you end up using heat on your hair like your sister made you promise you would for her wedding? Those scarves are SO fab!! You and your sister are beautiful! Congrats to them!